The new song, "Kill This Love,"→"Cochella,"→"North America Tour”→“Global Stage”!! Leading U.S. media outlets reported the news on April 5 with expectations pouring in on Black Pink's comeback with their new album. 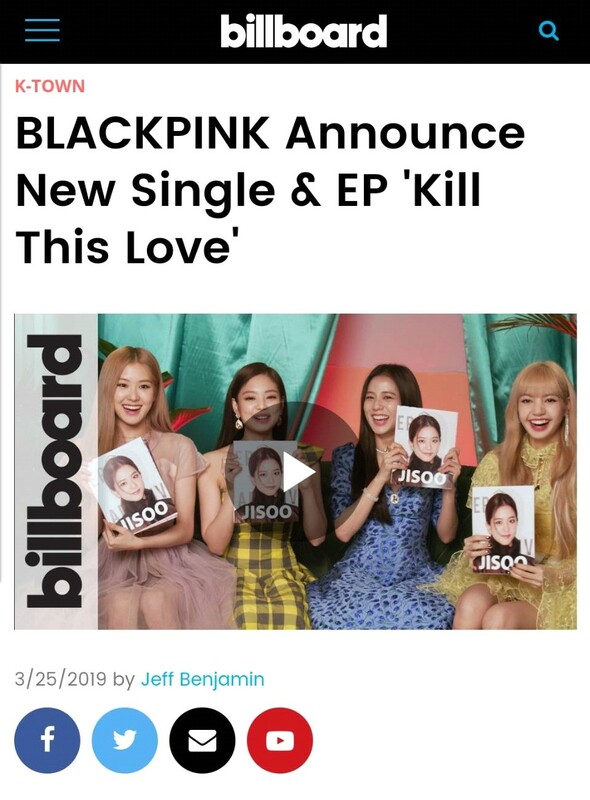 Music media outlet Billboard said the title track "KILL THIS LOVE" and the EP album of the same name will be much more powerful than previously released, according to a quick report on Black Pink's comeback. Black Pink's new song "Kill This Love" was produced by Teddy, who created Black Pink's signature songs such as "DDU DU DDU DU." grand drum sounds are the main theme songs, with each member's charismatic rap and vocals added to complete the high quality. Black Pink will start a full-fledged U.S. activity following appearance in the new EP album, "Cochella." Starting April 17, he will continue various local promotions with his North American tour, starting with Los Angeles in the U.S. Attention is focusing on how highly Black Pink, which has jumped to become a global girl group, will make its debut on April 5, as it travels around the world through "Kill this Love."